What do you think of the colorful DanaLouFit bikini I'm modeling in the top photo? It is much more than meets the eye. 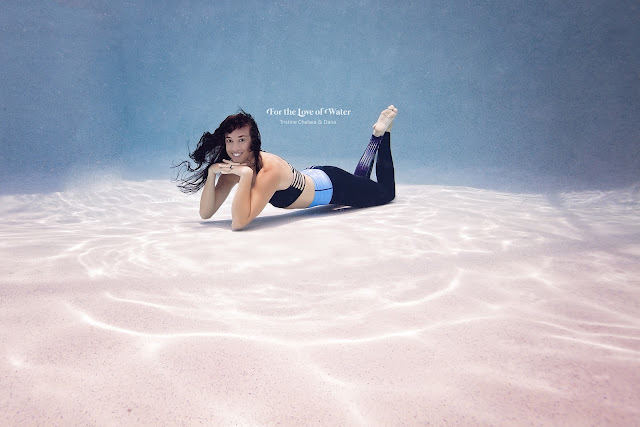 That is sweet Dana Lou modeling in the center photo and our talented underwater photographer modeling in the photo below her. I'm honored to team up with these beautiful souls and their "For the Love of Water" campaign. Kick back and relax to find out more. Dana started her fitness apparel line with heart and experience. Her designs are functional and comfortable for an active lifestyle. She personally makes and tests out patterns before production. With a specialization in active wear, it was a perfect idea to make swimwear as well. The one-piece swimsuits and bikinis are adjustable, stylish and feel amazing on. My high-neck top and brazilian bottoms are great for swimming, surfing and more. I love the trending "wrap around" top with brazilian bottoms Tristine is wearing. You can also get one-pieces with long sleeves, sporty tops, shorts, surfing leggings, sports bras and rash-guards. The stitching has flat seams and the prints are to die for. They will even give you free hemming services for your leggings, as seen on Dana. Most of the swimwear is reversible, too! DanaLouFit is a brand that stands for everything we can and should believe in! It was founded on the principle of kindness to everyone (including ourselves) and to do it with style and confidence. DanaLouFit is a family business with all products hand-made in sunny Florida. Everything is made by Dana and her lovely team in their Jensen Beach shop. DanaLouFit also graciously gives back to community locally and globally, along with non-profit organizations. Dana is supportive of her community and provides every opportunity for locals to work with her company instead of out-sourcing. One of her photographers is none other than a local favorite Tristine Davis and one of her gorgeous models is local yogini Chelsea Kristine. Together these three mermaids make up the unique marketing team "For the Love of Water." As a teacher for many years, I found it essential to incorporate spreading kindness and helping the environment into every lesson. As a swimwear blogger, I am still trying to do the same thing. I do love fashion as much as the next girl but the fashion industry isn't as glamorous as I thought. I'm constantly on the hunt for sustainable swimwear and I love to share brands that I know are doing their part to preserve the ocean we swim in while spreading kindness. DanaLouFit does just that. They recycle fabric scraps by using them in future products and they do not throw anything away. Most of the fabrics are produced in an eco-friendly way, including not using dying techniques that use water and cause water pollution. Soon you will be able to purchase DanaLouFit leggings made with a printed fabric from an incredible photo Tristine took of a coral reef. A portion of the sales will be donated to reef/ocean conservation. Phenomenal! Become a "Driven Warrior" with DanaLouFit today! Find out more and shop on the website at www.danaloufit.com. Please let us know how you DanaLou.